Nine’s Australian Ninja Warrior hasn’t suffered any second episode syndrome, managing an impressive 1.6 million viewers for Monday night’s episode according to OzTAM viewer numbers. And in better news for Nine, Ninja pummelled its rivals at Seven and Ten, almost doubling their audience shares. Ten’s MasterChef clawed back its Sunday night losses posting 753,000, while Seven’s two-decade homage to Princess Di’s death, The Last 100 Days of Diana, managed 768,000. But it’s not all smooth sailing for Ninja with the show’s commentary team already being attacked for their lacklustre performances and poor acting for trying to look excited about the show. The commentators include Nine’s ‘everywhere man’ Ben Fordham, Nine sports reporter Rebecca Maddern and former England Test cricket captain Andrew ‘Freddie’ Flintoff. However, only two episodes in and many fans have labelled the commentary “abysmal” while a concerted social media campaign has commenced to have the trio replaced with the incomparable Roy And HG Nelson. Other viewers took to social media to say they were having trouble comprehending Flintoff’s thick accent. While another weighed-in on the choice of Flintoff as commentator. “Shocking oversight from Channel Nine,” one wag wrote, “240 unemployed Australian cricketers and they go for a retired Pom.” A clear dig at the current cricket pay dispute. While others attacked Maddern for trying to sound like “one of the boys” and her overuse of sport clichés. “Why do women commentators talk like blokey blokes? Isn’t the whole point to promote an alternative sound to the blokey bloke,” one viewer queried. However, a quick check of the #NinjaWarriorAU handle shows a big demand for the appointment of Roy and HG. 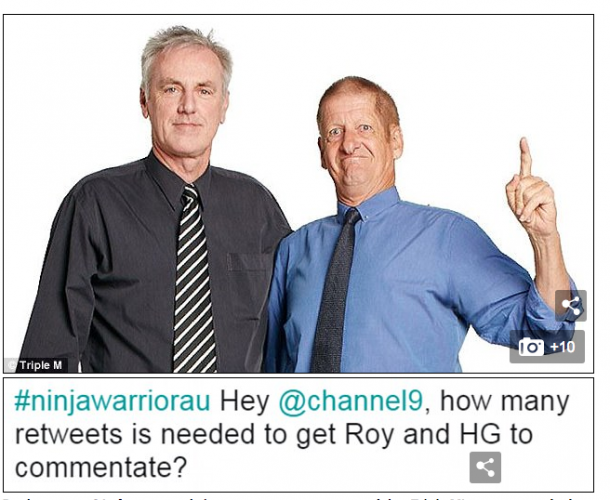 “Hey Channel Nine, how many retweets is needed to get Roy and HV to commentate?” one demanded.